Planting succulents in enamel ware will give you an endlessly different look for your garden. Vintage enamel ware pots, buckets and old saucepans are everywhere in junk piles, old homesteads, barns and garage sales. I’ve found them in junk stores, recycle centers, and even those crushed almost beyond recognition in old garbage pits, or shot full of bullet holes can be salvaged and planted with succulent plants. 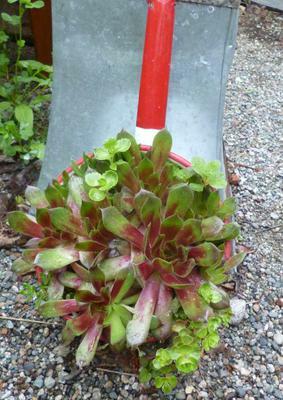 I love using the brightly coloured or granite bake ware, planting them with Sedum and Sempervivum. Look for the good quality old fashioned ones, even if the enamel is chipped or cracked. These types of planters give your container garden some character. If your look is rustic country, succulents billowing over the edges of the many coloured enamel pots, buckets and other containers will fit right in. Make sure there is a drain hole – in many cases, you won’t need to worry about this if the bucket or container is old – the rust takes care of providing a drainage hole for you! If not, a couple of nail holes bashed into the bottom of it will fix the problem. If there is a lot of rust, simply use the container as a cache pot, placing your succulents in a plastic pot inside, and mulching the top to disguise the fact. 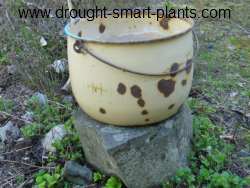 This technique will demand careful watering, as it’s more difficult to tell if the plants are wet or dry – be especially vigilant after a rainfall, as the bottom of the cache pot could be full of water – succulent plants will die if they sit in water or have waterlogged soil. 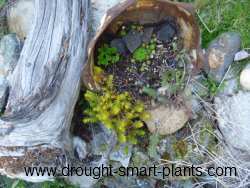 Most succulents have very shallow roots and don’t need a deep root run – fill the bottom of the container with an empty milk jug (leave the lid on so soil doesn’t get inside) or use a bag of Styrofoam popcorn. This will take up some of the room in the container, and the soil will hide the artificial filler. If you live in a windy area, put a few larger rocks in the bottom to hold the container steady, especially if you have top heavy plants. Display any metal containers, including the enamel ware kind, out of direct sun. The amount of heat generated by the sun on the metal will kill most roots, even on extremely tolerant and hardy plants. Water generously once or twice a week, if necessary, and then allow the soil to dry out. Fertilize with worm castings, either sprinkled on the top of the soil, or made into compost tea.